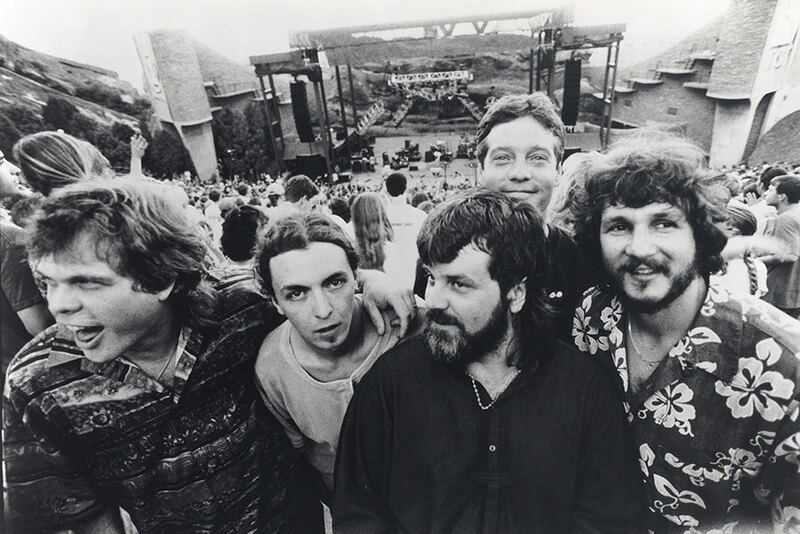 Serving up self-described “polyethnic Cajun slamgrass”—a unique brand of bluegrass-based boogie that drew from miscellaneous influences—Leftover Salmon won an astounding national following on the jam-band circuit. The group formed in 1990 with the merging of two Boulder outfits—the Left Hand String Band, known for progressive bluegrass, and the Salmon Heads, who did crazy Cajun music. “I had moved to Colorado after I attended the University of West Virginia, frontman Vince Herman explained. “In Appalachia, there are a bunch of old-timey music festivals. But the Colorado scene was different. Progressive bluegrass was happening with Hot Rize and the Telluride Bluegrass Festival. It was the meeting place between California and the East Coast scene. The lineup eventually settled with Herman, Emmitt and Vann, Michael Wooten (drums) and Tye North (bass). “We had a ton of gigs because the scene was real tight in 1990,” Herman said. “All the promoters and bar owners knew each other, and there was a lot of work in the ski areas. We didn’t leave the state for over two years. Joyous freeform sets at traditional events (the Telluride Bluegrass Festival in Colorado and the Merle Watson Festival in North Carolina) and raucous rock jaunts (a two-week stint on the H.O.R.D.E. tour) resulted in the band’s 1993 self-released debut album, Bridges to Bert. The band crisscrossed the country in an old yellow school bus, a grueling schedule that continued for years. “We named the bus Bridget, and we put 800,000 miles on her,” Herman said. Ask the Fish was a 1995 live effort recorded at the Fox Theatre in Boulder, but hundreds of concert recordings exist—the band encouraged fans to tape its shows. In the studio, Leftover Salmon searched for ways to incorporate the variety of musical styles heard at its concerts. Euphoria, 1997’s major-label debut on Disney’s Hollywood Records, peaked at #3 on Billboard’s Mountain Regional roundup. “We’re a strong touring band, and ‘rehearsal’ is one of those French-sounding words that we don’t quite understand,” Herman said of the band’s devotion to the road. “That ‘L.A. process’—’Let’s make a record and then try to get somebody to listen to it’—is one part of the music industry that I’ve never understood. By the end of the 1990s, Leftover Salmon had the opportunity to record The Nashville Sessions, which teamed the band with an A-list of Music City’s most notable session players. 2002 started out on a sad note for Leftover Salmon with the melanoma-related death of Vann at age 38. The group experienced some internal restructuring and continued to hit the open road relentlessly, taking part in a tour with bluegrass giants the Del McCoury Band and releasing an album with the band Cracker. But the last months of 2004 brought an end to Leftover Salmon. In 2007, Leftover Salmon returned for a handful of reunion shows and continued to tour and record. The band’s bluegrass roots remained.